The Sultans are a South West based 6-piece group consisting of vocals, a rhythm section of guitar, bass and drums augmented by tenor and alto saxophones. We are all experienced musicians and well presented, used to playing everything from festivals to formal black tie events. We provide our own P.A. and lights and, if required, appropriate music between and after our sets. Whether you are a pub, a club, or organising a wedding, party, regatta, festival or other event we would love to play for you. Our sound is a lively blend of swing, rhythm and blues, rock ‘n’ roll and latin all played primarily for dancing. The audio tracks on this site give an indication of our professional live sound. If you would prefer these tracks on CD, please contact us and we’d be happy to send you a copy. A song list is available here, and we are more than happy to tailor the set to your tastes from this list or even adapt a favourite of yours if appropriate. 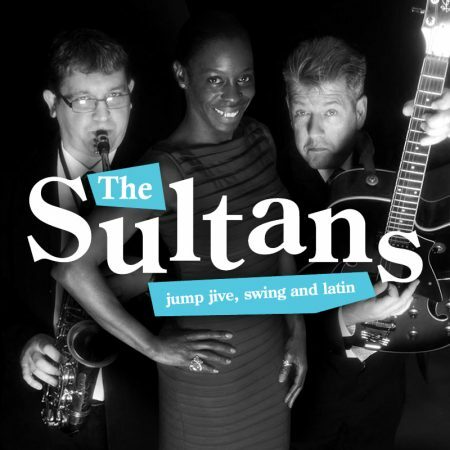 Booking The Sultans will ensure a lively event sure to satisfy jivers, twisters, rock ’n’ rollers and salsa dancers alike.